As athletes bathed in the warmest May Day bank holiday weather on record in Britain, Cameron Chalmers led some scorchingly hot performances on the third day of the BUCS Outdoor Athletics Championships in Bedford. 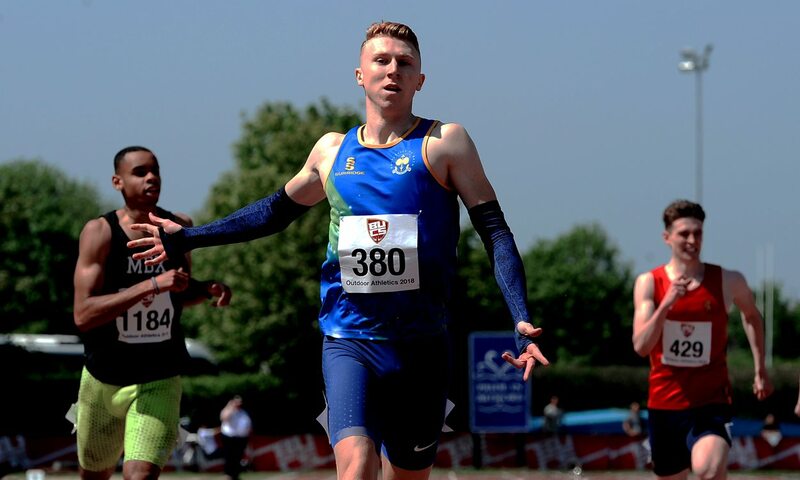 The Guernsey Commonwealth Games representative took his third BUCS outdoor 400m title in a row, dipping three hundredths inside the European Championships standard with 45.97. He then followed up with a scintillating anchor leg of 45.2 seconds to take Bath to gold in the final event, the 4x400m (3:11.35). 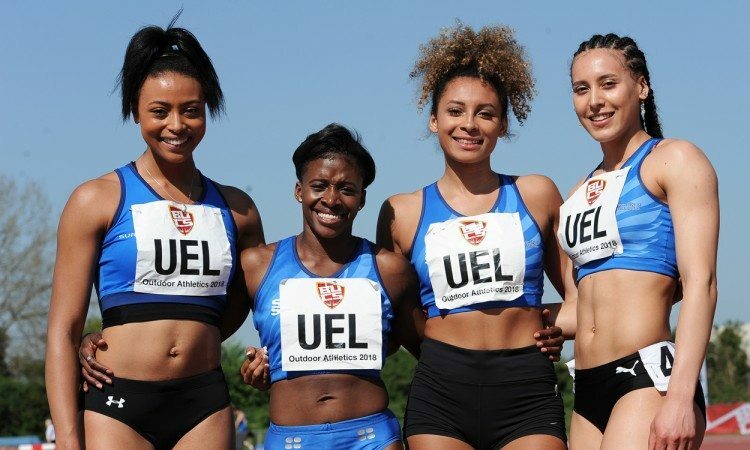 European junior 200m champion Maya Bruney showed good strength as she came past one-lap specialist Laviai Nielsen at the end to clock 53.10 in the 400m, later returning to the track to anchor University of East London (pictured below) to 4x100m relay gold in 46.25. Jessica Judd followed up reaching the final of the 1500m at the Commonwealth Games by taking her fourth successive BUCS outdoor title, this time at 5000m. The Loughborough University student, who had taken BUCS titles at 800m, 1500m and then 800m in the previous three years, moved clear of the lead group with just over 2000m to go to clock 16:10.81. A month after finishing fifth in the Commonwealth Games, high jumper Allan Smith had to be content with 2.18m but was happy to come away with the win. Behind the Edinburgh Napier University athlete, silver medallist Chris Kandu, a 2015 European under-23 bronze medallist, took second with a best of 2.15m. 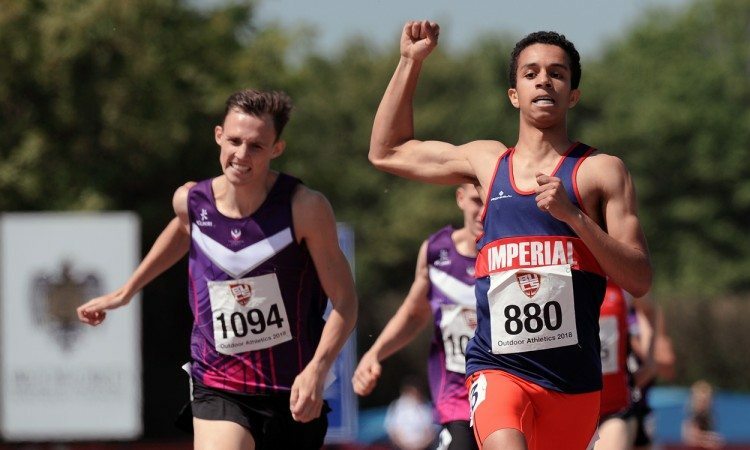 University of Birmingham’s Mari Smith clocked a PB of 2:03.71 and came close to the championship record to win the 800m title ahead of Mhairi Hendry, while Imperial’s Daniel Rowden (pictured below) won the men’s final in 1:50.47. Brunel’s Marvin Popoola completed the sprint double, taking his preferred 200m in a personal best 21.13 after yesterday winning the 100m. World indoor representative Megan Marrs took one of the closest races of the weekend, the Loughborough athlete clocking 13.58 to narrowly deny American heptathlete Chari Hawkins and GB junior international Mollie Courtney in the 100m hurdles. Among other winners were Georgina Rogers in the 400m hurdles (58.59) and Khai Riley-La Borde in the 110m hurdles (14.00). Adele Nicoll (15.17m) in the shot and Jamie Webb (3:50.85) in the 1500m both took their third consecutive titles. A report on Saturday’s action can be found here.